The end of the semester is nigh, and in these last two weeks, I get to sit back while my students take center stage by giving a presentation on a pre-approved topic. They have been working on their topics on and off all semester with the grand finale imminent in the forms of a presentation and a formal research paper. (In case you haven’t guessed yet, I teach writing). Anyway, one student did her work on a topic that is a personal crusade, and that is texting while driving. Several years ago in my hometown, five young women, former cheerleaders who had just graduated from high school, were on their way for a post-grad blowout at the cottage of one of the girls’ parents. They never made it. They never made it because they were all killed in a horrific accident caused by the driver’s text messaging. Absorbed in her message, she drifted across the center lane and slammed headlong into a tractor-trailer — all of this with both vehicles traveling at 60 mph. This incident made national headlines, and was the impetus for many anti-texting-while-driving programs. In today’s talk, the young woman presented us with a video the likes of which I have never seen. 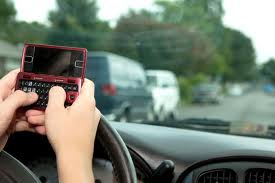 As I wrote on my Facebook page, if you continue to text while driving after seeing this, then …. well, not only do I not have much regard for your intelligence and common sense, I pray to God I am never on the same road as you.